Who says that E3 is the only place to unveil a new game during E3 week? Japanese weekly manga magazine Jump has the latest from Square Enix, a Nintendo 3DS game called Final Fantasy Explorers. This will not be a traditional Final Fantasy in the sense that Bravely Default is, but rather, it is an online multiplayer co-op action RPG. Final Fantasy Explorers will allow you to choose from the usual Final Fantasy job classes and battle through the series’ classic Summon monsters on a quest to find crystals. White Mages will heal the team. Monks will brawl with his bare-hands and “overwhelm the enemy with his surging dash.” Knights will be the tank and act as a shield, and Black Mages, with their lame redesign, will focus on long distance magic attacks. Jump also says that more character classes are coming, so you’ll have to find a balanced party if you want to get anywhere. The simple team provided in the reveal is just the most basic, and hundreds of more options will be available. Can’t wait to see Let’s Plays of four White Mages blasting through the game. Final Fantasy Explorers will have a large variety of weapons and items to unlock and choose from, and the first Summon monster to be revealed is the classic fire beast, Ifrit. 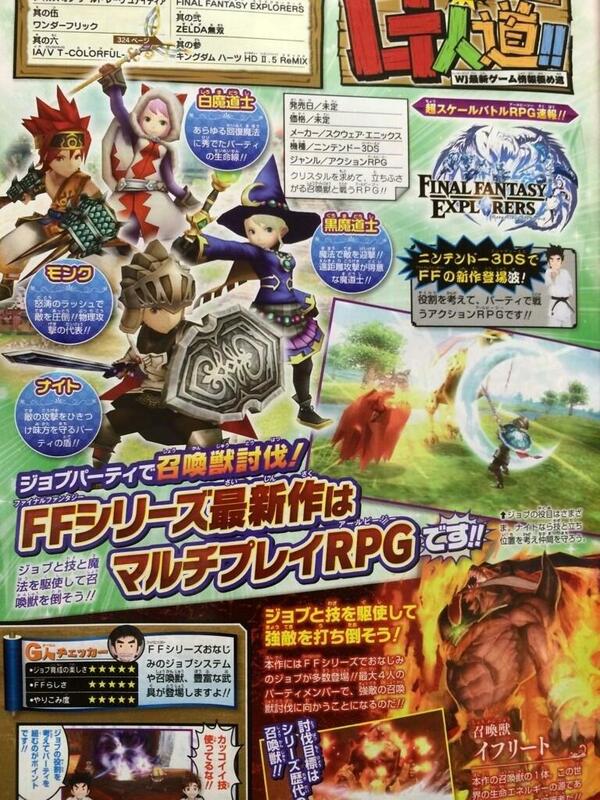 Looks like a decent little action RPG, so we’ll have to wait and see if Square Enix plans on a localization. No release date has been confirmed yet, so we’ll keep an eye out for more.